Hot on the heels of Triton’s recent demise comes news of NeoEdge, a distribution service promising a series of new twists on the Steam/Triton formula. Did I mention that it might be distributing Bioshock? Long-term publisher contracts are expanding Steam’s library. But are they doing so at the expense of Valve’s integrity? Seeing as it has been an extremely quiet period lately, a wrap-up of what is currently known of Valve’s future plans for Steam seems worthwhile. Garry’s Mod, the Source-powered physics sandbox famed across the games industry, is to be sold over Steam for $10 US. What does the move mean? 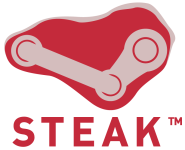 Today, Steam doesn’t achieve much more sitting in your system tray than shortening start-up times. But that residency is a hugely important resource for developers of coming-generation MMOs and user-driven games, to the point of outright success or failure. Why, and how?